Let’s cut to the chase, last question first. Yes, if you’re a professional working today, you’re just being lazy if you’re not on LinkedIn. It matters. Sorry to be so blunt, but dancing around it doesn’t help. 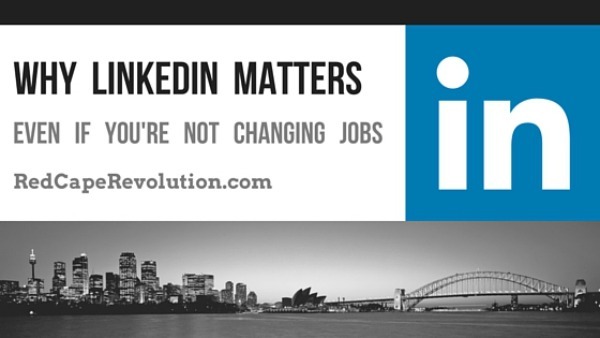 And even if you’re not looking for a new job, your LinkedIn presence (or lack thereof) tells a story about you–how current you are, how connected you are, and how valuable you are. And, LinkedIn’s no longer some spankin’ new technology. Heck, it’s now owned by tech behemoth Microsoft. Since it’s been around for a while, if you don’t have a minimum of 500 connections, you appear out of date and like you just don’t care about your career. I’m not saying you ARE. I’m just saying that’s how it appears. Plus, having 500 or more connections helps harness the full power of LinkedIn, which is not only to connect with those you know, but to help you find those who you know know. That comes in handy when you’re looking for a new opportunity, a new resource, or a new customer or client. So if you’ve been asking how to get to 500 connections on LinkedIn–or even more!–here’s five steps, plus scripts you can use when you’re reaching out. A. Go to my LinkedIn profile here. c. Add a personal note. This is an absolute must for me or anyone who you don’t know in person. For me, tell me you’re reading my article and taking me up on my offer to connect. Don’t worry about being clever or cute–the invitation box only allows you a few sentences, anyway. d. Hit “Send Invitation.” Easy peasy. Your friends probably have jobs, right? And they know people who know people, right? Our work life isn’t separate from our home life anymore, and there’s absolutely nothing wrong with reaching out to your social contacts to include them in your LinkedIn network. Yes, your coworkers are on LinkedIn and if not, should be. Don’t worry that they’ll think you’re looking for a new job. Maintaining and expanding your professional presence on LinkedIn today is just good career management. Remember that your clients, customers and even new colleagues are looking you up on LinkedIn, too–not just recruiters or new employers. Same deal. Your clients, customers and vendors aren’t companies; they’re humans. And adding them to your LinkedIn network should be an automatic step each time you interact with a new human. Here’s one that can increase your reach exponentially. Have you read an article or book, or heard a speech that resonated with you? The creator of that content almost always wants to hear from you. In fact, he or she has intentionally put him or herself in the public eye, typically with the desire to make an impact. So if they impacted you, reach out. In fact, I can tell you from personal experience that most LOVE hearing from their readers/viewers. After all, it takes a lot of guts to put your ideas out into the world, so why not give a little of that love back? You may be surprised how many of your favorite authors, local broadcasters, or journalists will accept your invitation. Whew! How many do you have now? Just send a few invitations a week, and pretty soon, your numbers will climb. But more importantly, your visibility will accelerate and the power of your network will expand exponentially. You can do this. Let’s go get 500 connections on LinkedIn for you now!